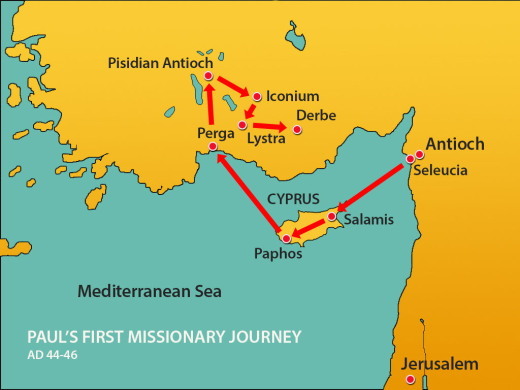 Paul's first missionary journey. Paul and Barnabas visit Lystra and Derbe. and I championed the cause of the stranger. and made them drop their prey from their teeth. 14:1 The same thing occurred in Iconium, where Paul and Barnabas went into the Jewish synagogue and spoke in such a way that a great number of both Jews and Greeks became believers. 2 But the unbelieving Jews stirred up the Gentiles and poisoned their minds against the brothers. 3 So they remained for a long time, speaking boldly for the Lord, who testified to the word of his grace by granting signs and wonders to be done through them. 4 But the residents of the city were divided; some sided with the Jews, and some with the apostles. 5 And when an attempt was made by both Gentiles and Jews, with their rulers, to mistreat them and to stone them, 6 the apostles learned of it and fled to Lystra and Derbe, cities of Lycaonia, and to the surrounding country; 7 and there they continued proclaiming the good news. 8 In Lystra there was a man sitting who could not use his feet and had never walked, for he had been crippled from birth. 9 He listened to Paul as he was speaking. And Paul, looking at him intently and seeing that he had faith to be healed, 10 said in a loud voice, “Stand upright on your feet.” And the man sprang up and began to walk. 11 When the crowds saw what Paul had done, they shouted in the Lycaonian language, “The gods have come down to us in human form!” 12 Barnabas they called Zeus, and Paul they called Hermes, because he was the chief speaker. 13 The priest of Zeus, whose temple was just outside the city, brought oxen and garlands to the gates; he and the crowds wanted to offer sacrifice. 14 When the apostles Barnabas and Paul heard of it, they tore their clothes and rushed out into the crowd, shouting, 15 “Friends, why are you doing this? We are mortals just like you, and we bring you good news, that you should turn from these worthless things to the living God, who made the heaven and the earth and the sea and all that is in them. 16 In past generations he allowed all the nations to follow their own ways; 17 yet he has not left himself without a witness in doing good—giving you rains from heaven and fruitful seasons, and filling you with food and your hearts with joy.” 18 Even with these words, they scarcely restrained the crowds from offering sacrifice to them. 10:31 The Jews took up stones again to stone him. 32 Jesus replied, “I have shown you many good works from the Father. For which of these are you going to stone me?” 33 The Jews answered, “It is not for a good work that we are going to stone you, but for blasphemy, because you, though only a human being, are making yourself God.” 34 Jesus answered, “Is it not written in your law, ‘I said, you are gods’? 35 If those to whom the word of God came were called ‘gods’—and the scripture cannot be annulled— 36 can you say that the one whom the Father has sanctified and sent into the world is blaspheming because I said, ‘I am God’s Son’? 37 If I am not doing the works of my Father, then do not believe me. 38 But if I do them, even though you do not believe me, believe the works, so that you may know and understand that the Father is in me and I am in the Father.” 39 Then they tried to arrest him again, but he escaped from their hands. In Lystra there was a man sitting who could not use his feet and had never walked, for he had been crippled from birth. Lord, on this day I chose to put You first. Thank You that when You are at the center of our family, our lives are rich with love and goodness. Lord, be the running stream, springing up at the very heart of our household. Might we drink daily from the water of life, that our days would be filled with kindness, forgiveness, trust and love. Open my eyes to behold your gracious hand in all your works; that rejoicing in your whole creation, I may learn to serve you with gladness, faithfully managing your bounty. Let Tuesday always prompt my heart to place my life in You. To see Your holy will be done I give my life anew; for the sake of him by whom all things were made, your Son, Jesus Christ our Lord. ¡Dios tiene la última palabra! We can rejoice when we run into problems and trials, for we know that they are good for us—they help us learn to endure. And endurance develops strength of character in us, and character strengthens our confident expectation of salvation. And this expectation will not disappoint us. For we know how dearly God loves us because he has given us the Holy Spirit to fill our hearts with his love (Romans 5:3-5, NLT). The greenest grass is always found in the valley. Let him who walks in darkness and has no light, trust in the Name of the Lord and rely on his God. Walking in the dark can be scary. We can't see what's out there, or what might harm us. This summer at camp I came close to stepping on a copperhead snake. It was right in front of my tent door. Thank God, someone had a flashlight and saw it first. There are times in our lives when we feel like we're walking in the dark. The days and months can be very dark after someone we love dies. I've noticed that even my physical eyesight seems somehow weaker, as if the light in the sky were turned down. I open windows and leave the light on even while I sleep; the darkness seems to creep into everything. Other dark times include getting a diagnosis like cancer or stroke, losing a job, or having a marriage fall apart. The days can be terribly dark after something like that. We need light, we need hope. We need someone to walk beside us and be our strength and comfort. Isaiah offers us this hope. He writes, "Let him who walks in darkness and has no light trust in the Name of the Lord and rely on his God." God calls us to rely on Him whenever we are scared or grieving or frightened or worried. He will be with us; He will not leave us alone, to walk through the darkness without light. Jesus' birth into this world in the flesh further reminds us just how much God wants us by His side, to give us light and hope and peace. The Savior says these words of comfort to us: "I am the Light of the world. 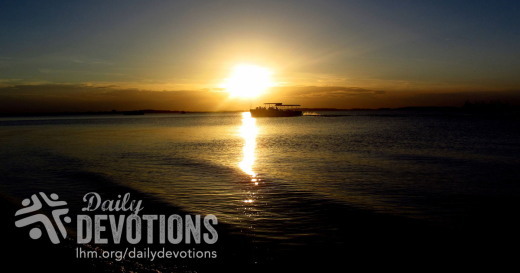 Whoever follows Me will not walk in darkness, but will have the light of life" (John 8:12b). Please note, He doesn't just give us light, He is Himself our light. And David says to God, "Even though I walk through the valley of the shadow of death, I will fear no evil, for You are with me; Your rod and your staff, they comfort me" (Psalm 23:4). He stays with us, close by our side -- even when we cannot sense Him there. He will not desert us. When dark times come, let us cling to Jesus with all our might. He is the One who will uphold us and give us His strength and His tender care. Who better could we trust than the One who died and rose again for our sakes? Who is greater than the One to whom God the Father has given all authority in heaven and on earth? Nothing can take us out of Jesus' care, not death or grief or fear or darkness. He loves us dearly. Let us put our trust in Him. THE PRAYER: Dear Lord, be with me in the darkness I face, and help me trust in You with all my heart. Amen. Walking in the dark can be scary. Hace más de 200 años, un hombre hizo fuego en la chimenea de su cabaña en las Montañas Blue Ridge, fuego que hasta el día de hoy sus descendientes han mantenido encendido. De más está decir que dicho fuego se ha convertido en el más antiguo de los Estados Unidos, y quizás del mundo. Lograrlo no ha sido una tarea fácil, y ha requerido el trabajo de muchas personas a lo largo de varias generaciones. A eso yo lo llamo dedicación, algo que no es muy común en estos días, ¿no es cierto? Lo que es común en estos días es que haya espías que venden 'secretos de estado', que la mayoría de las parejas que prometieron vivir unidas hasta la muerte no lo hagan y que, luego de ser elegidos, los políticos rápidamente olviden las promesas hechas durante su campaña. En contraste con todo eso, los cristianos tenemos la bendición de tener un Salvador que dedicó su vida a la salvación de nuestras almas. Por esa dedicación, Jesús fue malentendido por los hombres, traicionado y negado por sus amigos, y crucificado por las mismas personas que había venido a salvar. Aún así, Jesús se mantuvo en el camino que lo llevaría a la cruz. Y gracias a que así lo hizo, la tumba vacía nos asegura que tenemos un Salvador en quien podemos creer y confiar plenamente. Redimidos y restaurados, podemos dedicar nuestras vidas a dejar que nuestra luz brille en un mundo perdido y desolado. ORACIÓN: Señor Jesús, gracias por bendecirnos con tu amor incondicional. Ayúdanos a ser fieles testigos de tu amor, para que muchos más puedan recibir también tus bendiciones. En el nombre de Jesús. Amén. … No temas, porque yo te redimí; te puse nombre, mío eres tú (Isaías 43:1). Cuando fui a visitar el Monumento Nacional 11 de Septiembre, en la ciudad de Nueva York, fotografié de inmediato uno de los estanques reflectantes. 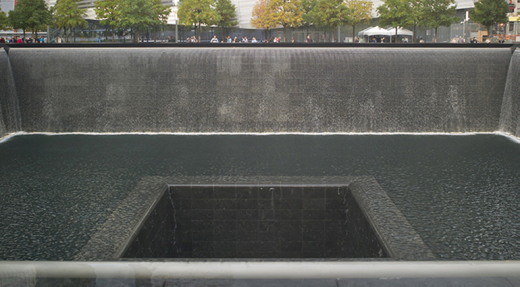 Alrededor de estos dos estanques, los nombres de casi 3.000 personas que murieron en el ataque al World Trade Center están grabados en placas de bronce. Tiempo después, mientras miraba con más detalle la foto, mis ojos se detuvieron en la mano de una mujer apoyada sobre un nombre. Muchos van a ese lugar para tocar un nombre y recordar a alguien a quien amaban. El profeta Isaías le recordó al pueblo de Israel sobre el amor inalterable de Dios y por cada uno de ellos, aunque se habían alejado de Él con frecuencia. El Señor afirmó: «No temas, porque yo te redimí; te puse nombre, mío eres tú» (Isaías 43:1). En el Salmo 23, David escribió: «Aunque ande en valle de sombra de muerte, no temeré mal alguno, porque tú estarás conmigo […]. Ciertamente el bien y la misericordia me seguirán todos los días de mi vida, y en la casa del Señor moraré por largos días» (vv. 4, 6). Dios nunca nos olvida. No importa dónde estemos ni cuál sea nuestra situación, Él sabe nuestro nombre y nos sostiene abrazados con fuerza en su amor inalterable. Padre, gracias por llamarme por mi nombre y rodearme con tu amor, hoy y siempre. Dios sabe nuestro nombre y nos abraza fuerte en su amor. Muchos van a ese lugar para tocar un nombre y recordar a alguien a quien amaban.